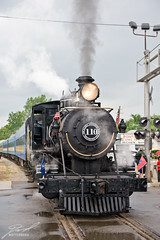 Every hour at the Train Festival 2009 the Little River 110 pulls a short passenger train around Owosso, Michigan. While at the platform we had the chance to try grabbing some photos. Fortunately we had a little rain which chased many of the guests giving us a clear shot of the locomotive.